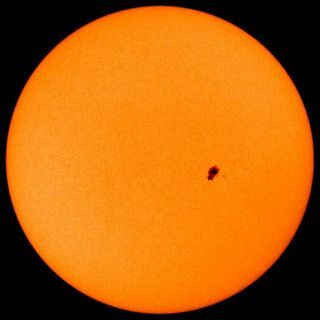 The Lonely Sunspot: Number 930 sits alone at a time when overall solar activity is near the low point in an 11-year cycle. The spot has been the source of several solar storms in recent days. A large sunspot that has been kicking up storms in recent days erupted again overnight with an X-3 solar flare. All X-flares are major. This latest event has set off a radiation storm that is preventing some sun-watching satellites from doing their jobs. Such storms are fairly common when the Sun is at its most active, but they are rare during the current low point in the 11-year cycle of solar activity. NASA and the astronauts aboard the International Space Station keep watch for strong radiation storms and sometimes retreat to the most protective part of the orbiting outpost to avoid exposure. Spacewalks are avoided during events like this. According to Spaceweather.com, "satellites may experience some glitches and reboots, but astronauts are in no danger." However, the astronauts were ordered to a protective area of the space station as a precaution. Flares of this magnitude can damage satellites and disrupt telecommunications on Earth. The sunspot, numbered 930, has been rotating across the face of the Sun for several days. Sunspots are dark regions of the Sun where intense magnetic activity caps the upwelling of material from below. Sometimes a cap blows, and a visible flare results. The flares are loaded with X-rays and other radiation, all of which reaches Earth moments after the eruption and can be accompanied by a shower of protons. These storms can arrive in moments with little warning and can be deadly. Last week, the same sunspot generated what astronomers described as a rarely imaged solar tsunami. The activity began with an X-9 flare Dec. 5. Skywatchers at high latitudes-Canada and possibly the very northernmost United States, for example-might want to keep an eye out for aurora, or Northern Lights, which can be spawned by solar storms. No major auroral activity is expected, however. Sunspot 930 has a small chance of producing additional major flares, according to NOAA-run Space Environment Center.